$1,775.00 each List: $3,178.00, You Save: $1,403.00! Ludwig Standard Timpani can be found in band halls across the country because of their reliability, simplicity, and low price tag. The balanced-action foot pedal is easy to manipulate, letting players think about pitch changes and stickings without worrying about how to work the pedal mechanism. 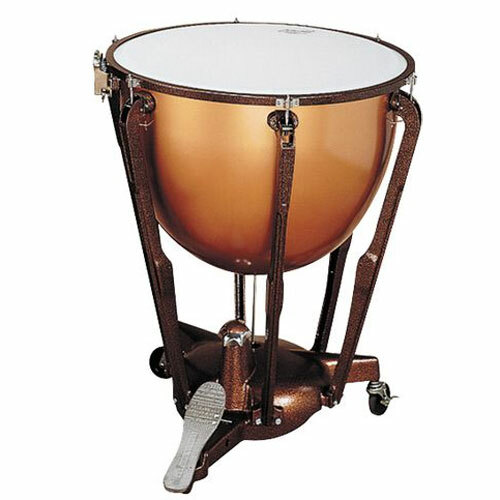 Fiberglass timpani are easier to lift and less susceptible to weather conditions than more expensive copper instruments, making them an excellent choice for marching bands or school orchestra programs on a tight budget. The parabolic shape gives you a tuning range of about a major 6th, and the professional tuning gauge can be set to accurately show the performer exactly where the pitches lie.